In the largest release of its kind ever, 2,000 captive-born rare bustards were released in Kazakhstan, thanks to an initiative supported by United Arab Emirates (UAE) President Sheikh Khalifa bin Zayed Al Nahyan. The birds were flown by plane from the breeding center to three release sites, some of them fitted with GPS tracking devices. Researchers will be able to track their population and migration, which stretches from Egypt in the west to Mongolia in the east. "Previously we have only carried out small-scale experimental releases in Kazakhstan in order to learn more about the migration and habits of the Houbara, but a release on this scale takes our efforts onto to a completely new level," said Mohamed Saleh Al Baidani, director-general of the International Fund for Houbara Conservation (IFHC) in a statement. Despite the release, conservation practices (or lack thereof) of houbara bustards have been criticized lately, after word broke that a Saudi Arabian prince allegedly slaughtered 1,977 of the birds -- a quickly declining species -- during a safari trip in Pakistan. While the species is protected from hunting in Pakistan, the prince was given special dispensation by the government. 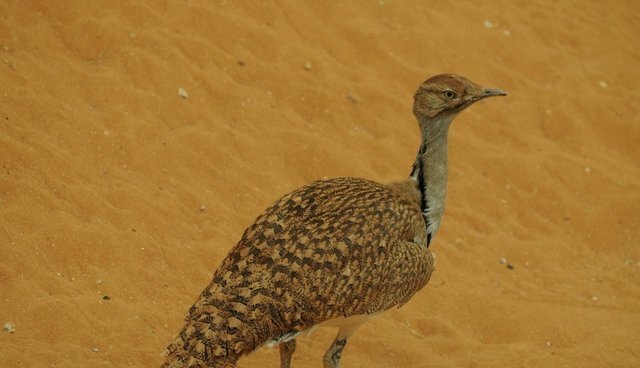 According to the IUCN, there are 110,000 houbara bustards left, but they are and declining at a rate of 20 percent to 29 percent each year because of hunting.